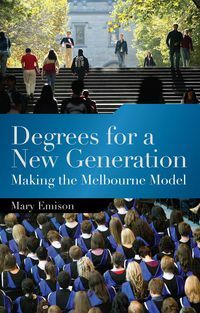 Mary Emison was educated in the United States before coming to Australia and holding a number of senior professional positions in the University of Melbourne. Her first role was coordinating all administrative activities for undergraduate students in the Faculty of Science. In 1984, Mary became Assistant Registrar in the Office for Research, and from 1994 to 2004 was responsible for establishing the University's first integrated unit for whole of university planning and quality assurance. In 2005, Mary was acting Academic Registrar and later worked with Professor Peter McPhee as Director of the Melbourne Curriculum Project.